During my first 50 mile ultramarathon, I only pee’d once. And it was within the first hour of the race. And I ran for almost 10 hours. But before we get too deep into my bladder issues, let’s first take a step back. I’m the type of runner who will schedule a whole shopping trip around a pre-workout dinner and invest plenty of cash in mid-run nutrition and recovery supplements. But let’s be honest. Food is only half of the fueling equation. Hydration is the other half, and arguably the more important half. Most distance runners have their own way of addressing hydration concerns by carrying water during long training runs and races. They have their favorite belt, handheld, or pack. But I’m willing to bet that most of us don’t adjust the size of our bottles based on the distance of the run. After all, when was the last time you even considered how much water you were losing per mile? For me, the answer is rarely. 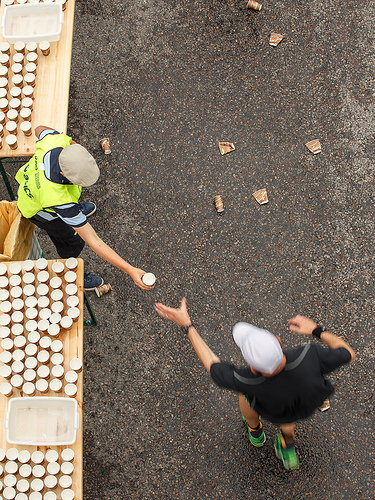 There’s an old belief that we’ve all probably heard at some point: “Drink until you can’t take another sip.” That is, drink before you run, and keep drinking as much as you can during the run. During exercise, athletes should start drinking early and at regular intervals in an attempt to consume fluids at a rate sufficient to replace all the water lost through sweating (body weight loss), or consume the maximal amount that can be tolerated. Seems logical enough. But that would require knowing how much water you are actually losing. The first place you should look is at yourself. Everyone sweats at different rates, so start by finding out how much water weight you lose through sweat during a run. You can do this by taking a sweat test. Weigh yourself naked before a run. Run for 60 minutes at race pace. Wipe yourself dry after the run. Subtract your after run weight from your before run weight. Whatever weight you lost during that run can be attributed to sweat. Inspired by a recent post from Matt Frazier of No Meat Athlete, I decided to give this a go myself. I went out on three separate sweat tests, each a few days apart. During the first, I lost almost 3.5 pounds in just one hour. The second was closer to 2.5, and the third 2.8. Average those together and I get 2.9 pounds of sweat loss per hour. If a pint of water is a pound of weight, that means I’d need to drink almost 3 pints (or 48oz) per hour. Just under a liter and a half of water. Whoa, that is a lot of water. Way more than expected. All three times I performed this test it was during a heatwave in Washington, DC, where temperatures were crazy high and humidity even higher. Had I run when it wasn’t so hot, I’m sure I would have lost less water weight. Different levels of effort = different levels of sweat. The harder you work, the more you will sweat, so an easy run will not have the same results as a difficult run. Back to those 48 ounces. The ACSM also recommends that a target should be roughly 1 liter of water per hour. My sweat test is telling me I need to take in even more. But a liter and a half of water is not only a lot to carry, it is also a lot to consume. And that raises both of my eyebrows. Contrary to the American College of Sports Medicine, recent research has shown that drinking to thirst may be more effective than drinking on a strict schedule. Plus it may save your life. As highlighted in Dr. Tim Noakes’ book Waterlogged: The Serious Problem of Overhydration in Endurance Sports, a growing issue in endurance running is hyponatremia, or when your sodium levels in the blood are diluted from drinking too much water, which can be deadly. In the book, he tells the story of the 2002 New York City Marathon, when a woman named Cynthia Lucero set out to run her first marathon. She followed the common advice to “drink early and often,” which had been repeated over and over by her coaches, and collapsed unconscious with less than 4 miles to go. A few hours later she died in the hospital. She didn’t die from a heart issue or exhaustion. She died from hyponatremia, or drinking too much water. 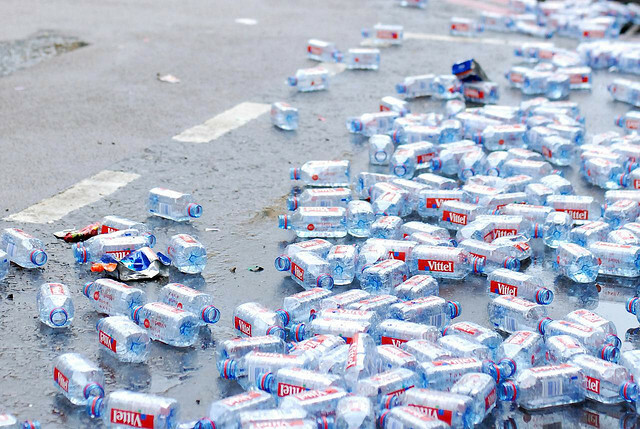 This trend of over-hydration has been popping up all over the endurance world. One of the most telling parts is, apparently it wasn’t a problem until the 1970s when sports drinks were introduced to consumers and the notion of drinking while exercising became popular. When these new studies looked at elite athletes, they found that top performers were loosing as much as 6-8% of their body weight over the course of the race. Their bodies were performing at top levels and remaining healthy, even with significant water loss. That is a drastic change from the recommendation of focusing on maintaining weight. So if we can’t trust the rule of drinking a set amount her hour, where does that leave us? Dr. Noakes suggests the answer is simple. Drink when you are thirsty, and not any more. The body has strong biological controls to maintain sodium and fluid balance even in the face of sodium deficits or states of fluid loss or even when fluid overload threatens in those who overdrink during exercise…When sodium or water is lost from the body, for example, the brain can direct the kidneys to retain either more or less sodium or water from the urine, or it can cause mobilization of sodium from internal body stores. It is when we do not listen to our bodies and override our biological instincts with advice from external sources that we run into problems that can, in fact, lead to catastrophe. In one ear we have people telling us to drink as much as we can tolerate, even over a liter per hour. And in the other ear we have research telling us to trust our body. That drinking to thirst will not only help us perform better, but could save our lives. When I think back to that first 50 mile race, I distinctly remember the one time during that race that I was very thirsty. I was stumbling through the course, cursing myself for not filling up my hydration pack at the last aid station. But even though it was a hot June day, those few miles made up the only time I felt dehydrated. The self regulation tactic had worked throughout the first 40 miles of the race, and had I not run out of water, I probably wouldn’t have even thought about hydration at all. Had I tried to drink the 48oz of water my recent sweat test told me drink, I may have pee’d more frequently, but I would have most certainly felt bloated and could have potentially been risking over-hydration. As endurance athletes we push our bodies to the limit on a regular basis. In my opinion, we owe it to ourselves to know as much about our bodies as we can. That means doing tests like the sweat test so we can better understand our own physiology and better prepare, but it also means listening to what our body is naturally telling us. We all react differently to extreme tests of the body. Get to know yourself. Get to know your needs. And drink when you’re thirsty. Not too early. Not too often. The 7-Minute Workout: Does it Work for Runners? Great post and I totally agree! I ventured into the ultra world for the first time this summer and I had all kinds of hydration problems. I definitely suffered from some mild hyponatremia on more than one long training run – unlike you, I was drinking an excessive amount of water just because I had started running with a hydration pack and it was just so easy to drink water out of a hose, so I JUST KEPT DRINKING. After a few runs of just not being able to figure out what was going wrong with my body, I switched to drinking strictly electrolyte mixes on long runs (Nuun, Fizz, etc) and all my problems went away. Not only did the flavor of water remind me that I only needed to drink it when I was actually thirsty, but even if I did still drink too much, my electrolytes were kept in balance, so I didn’t have any run-ins with hyponatremia again. I do sweat tests periodically…but I generally do them within a week of a race so that I can get as close to accurate (weather, fitness, etc) as possible. Mine ranges all over the place on the given day (in this heat wave, I am sweating buckets. I don’t even need a test to tell me that).